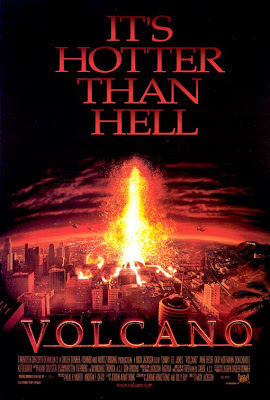 THE WEEKLY B-MOVIE NIGHT BLOG: Remember, Lava Is Only Dangerous If You Submerge In It For Several Minutes. Remember, Lava Is Only Dangerous If You Submerge In It For Several Minutes. Plot Synopsis: Quakes. Riots. Mudslides. Los Angeles has seen it all...almost. Get set for nonstop action, searing suspense and explosive special effects! Something unspeakably chilling is heating up The City of Angels. Beneath the famed La Brea Tar Pits, a raging volcano has formed, raining a storm of deadly fire bombs and an endless tide of white-hot lava upon the stunned city. Experience the pulse-pounding thrills as the dream capital of the world erupts into the stuff nightmares are made of.